These murals are multi purpose but primarily function as the backdrop for The Falcons Audible Podcast presented by AT&T. Additionally they are used as the backdrop for filming various segments such as interviews and other media content for both The Atlanta Falcons and Atlanta United. 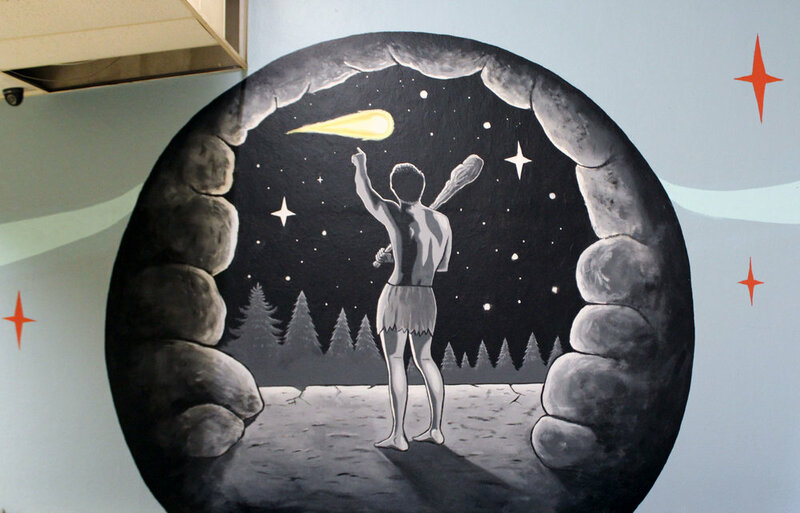 This mural located in the main atrium of Georgia State Stadium ( Formerly Turner Field). 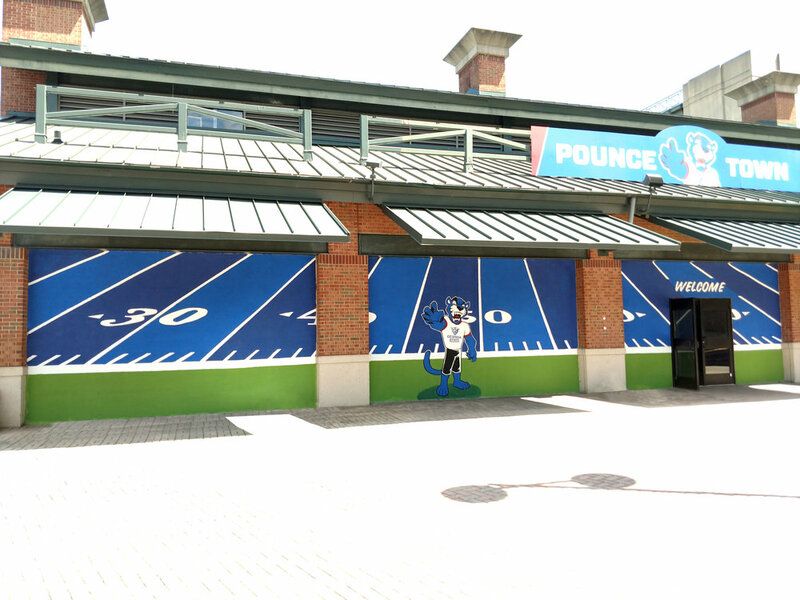 This mural invites stadium visiotrs to take a picuter with Pounce, and is signage for Pounce Town an area for children to play in. Portraits emerge on opposite sides of the box, as one single unbroken line, which spirals outward to form a portrait. One side is adorned with a portrait of the leader of the Civil Rights Movement, Dr. Martin Luther King, while on the opposite side is a portrait of rapper and social activist @killermike Mike. I choose to honor these two Atlanta natives for their dedication to fighting for human rights, social and economic equality and being a voice for the unspoken. As the lines spiral outward from the portraits, they begin to meander across the other panels until eventually they conjoin on the opposite side, representing the connection Atlanta artists have to the city’s legacy of social justice and political activism. 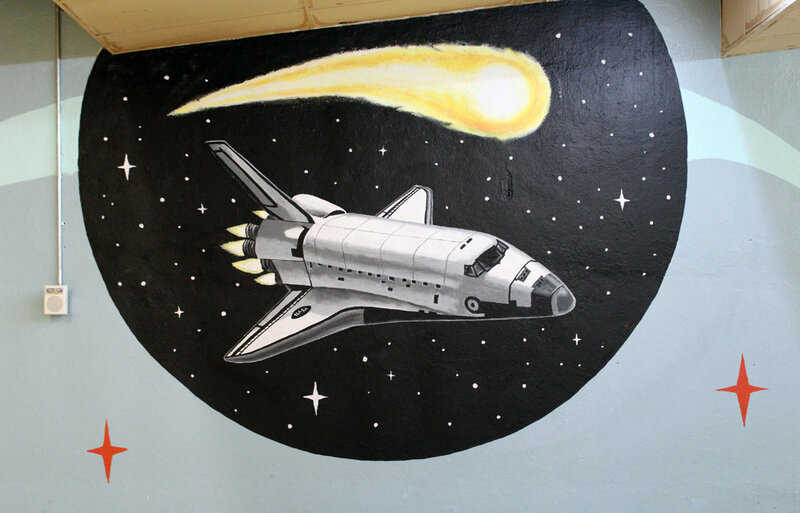 This mural depicts the history of the Halley's Comet. Starting on one side of the bowling alley and moving to the other wall. Each circle contains an event or date which Halley's Comet passed by Earth. Starting with year 245 B.C. when Halley's Comet was first recorded, and moving through time, capturing significant dates the comet passed Earth. These dates from left to right are 245 B.C, 1066, 1835, 1910, 1986, and ending in a futuristic interpretation of Atlanta in 2061, when Halley's comet will next return to Earth. "The story of Kefalonia is a story of the natural forces that have directly affected its landscape and culture. Enceladus 1953 seeks to represent these forces by referencing seismic data from the Great Kefalonia Earthquake in 1953, one of the most devastating earthquakes on the island to date. After being defeated during the Gigantomachy, the war between giants and gods, Enceladus was buried under mount Aetna. His restless movement is said to be the cause of the earthquakes. The seismic waves are rendered to reflect the landscape of Kefalonia, and the moon cycle is depicted as a reminder that we must always be aware of the natural forces that are constantly changing above as well as below." A collaborative mural completed by me, Brian Charles Egan, Wihro Kim, and Bianca Acosta during a two week artist residency in Kefalonia, Greece. 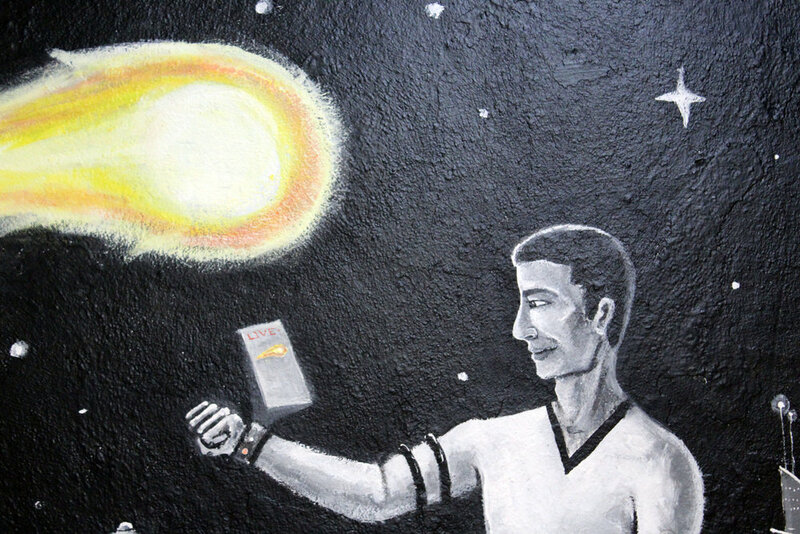 This mural was commissioned by the Ionion Culture Center. A collaboration between me and Adam Podber. Located at the corner of Gartrell and Boulevard in the Edgewood neighborhood in Atlanta, Georgia. 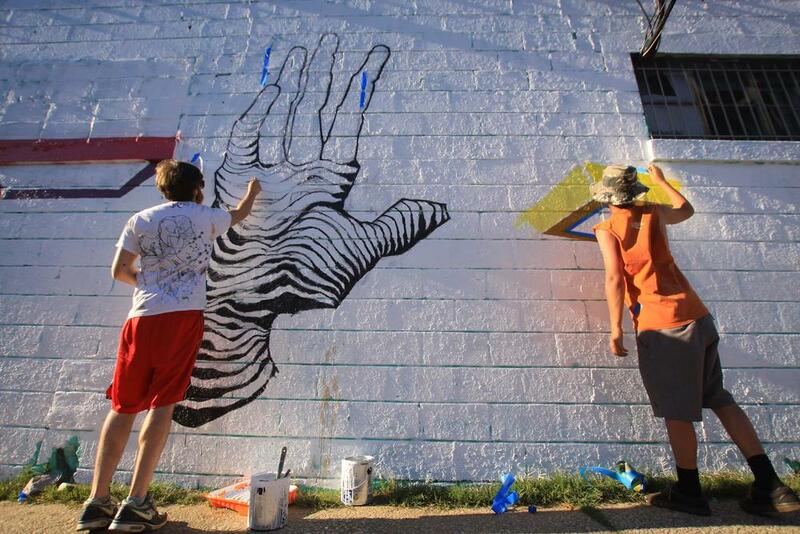 Mural commissioned by Longstreet Solutions. At their office in Steel Works on Krog Street.